Small scraps or small replacement pieces. SKU used for purchase after contact only and will be repriced once we determine your requirements. Custom Brake Booster Cover- up to 3" Wide, 12" Long (other sizes available): Email to discuss your specific dimensions and final pricing. Custom Fan Shroud Cover- up to 3" Wide, 15" Long (other sizes available): Email to discuss your specific dimensions and final pricing. Custom Battery Cover. Email to discuss your specific dimensions and final pricing. Custom Cover- up to 6"x6"x2". Email to discuss your specific dimensions and final pricing. Custom Fan Shroud Cover- up to 7" Wide, 12" Long (other sizes available): Email to discuss your specific dimensions and final pricing. Custom Cover- up to 8"x8"x2". Email to discuss your specific dimensions and final pricing. Custom Battery Side Cover. Email to discuss your specific dimensions and final pricing. Custom Cover- up to 10"x10"x2-7/8". Email to discuss your specific dimensions and final pricing. 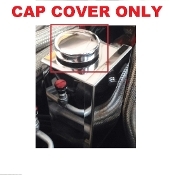 Custom Fan Shroud Cover- up to 5" Wide, 24" Long (other sizes available): Email to discuss your specific dimensions and final pricing. 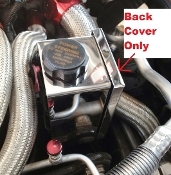 1 or 2 Piece Radiator Shroud Cover up to 7" wide x 30" long, up to 2 bends front and back. Available in Polished or Brushed Stainless Steel. Email to discuss your specific dimensions and final pricing. Custom Intake Manifold: Email to discuss your specific dimensions and final pricing. Custom Door Sills/Rocker Panels: Up to 48" long. Email to discuss your specific dimensions and final pricing.